Counterpart. Dual roles are all the rage (James Franco in The Deuce, Zach Galifianakis in Baskets, Ewan McGregor in Fargo), but no one doubles up quite the way Oscar winner J.K. Simmons (Whiplash) does in this Berlin-set spy series with a sci-fi twist. Simmons plays Howard Silk, a low-level employee of an international agency so secretive he doesn't know the purpose of the tasks he's performed for 30 years. His stalled career gets an unexpected boost with the appearance of another Howard, a man who's led a very different life and who may be about to change both of theirs. Even those who prefer that their spy dramas stick to one universe should appreciate two of the best performances we're likely to see this year. 8 p.m. Sunday, Starz. Morning Show Mystery: Mortal Mishaps. 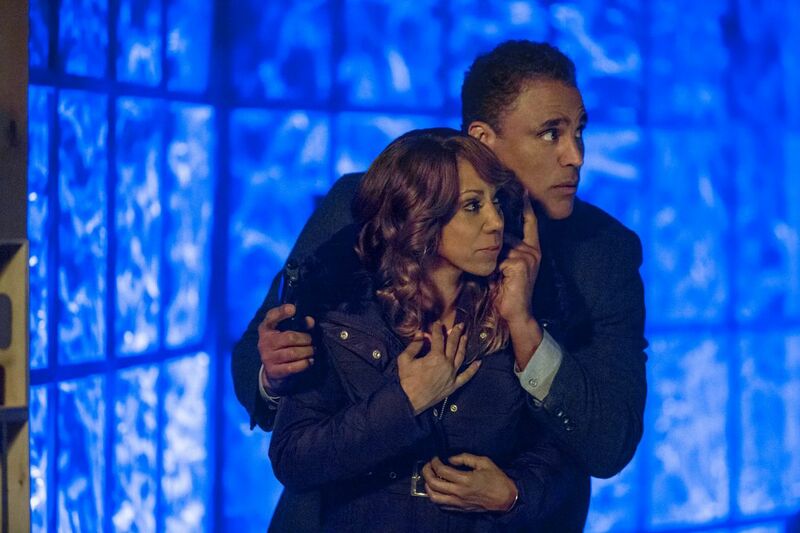 Mount Airy's Holly Robinson Peete stars opposite Rick Fox in a TV movie in which she plays a chef who becomes a murder suspect after an executive on the show for which she does cooking segments is poisoned. Fox plays the cop investigating the case, and, naturally, they have some history. Adapted from a novel by Today show weather guy Al Roker. 9 p.m. Sunday, Hallmark Movies & Mysteries. Mosaic. Steven Soderbergh's latest experiment began as an app, released in November, in which users could choose their own paths through a murder mystery whose stars included Sharon Stone as a famous children's book author who goes missing and Frederick Weller (In Plain Sight) as the man jailed for her murder. I had too many already assembled shows to watch then, but now that it's a five-night miniseries, I might try again. 8 p.m. Monday-Jan. 26, HBO. The Alienist. Caleb Carr's 1994 novel of murder in the Gilded Age becomes a 10-episode series starring Daniel Bruhl as the title character, Dr. Laszlo Kreizler, a pioneer in psychiatry using new methods to try to catch a serial killer. Dakota Fanning is Sara Howard, a young woman trying to make her way in the New York police department run by then-commissioner Theodore Roosevelt (Brian Geraghty), and Luke Evans is John Moore, an illustrator for the New York Times whom Kreizler enlists in his investigation. Like the book, it's as much an immersive experience of 1890s New York as it is a murder mystery. 9 p.m. Monday, TNT. We'll Meet Again. Today show veteran Ann Curry produces and hosts this documentary series that reunites people who were divided by history. This week's premiere features people whose separations were a result of World War II. 8 p.m. Tuesday, WHYY12. The Goldbergs: 1990-Something. The school-based spin-off that ABC passed on last spring gets a special airing this week, and the show's creator, Jenkintown's Adam F. Goldberg, is hoping enough people will tune in to convince the network it deserves a second chance. 8 p.m. Wednesday, ABC. Waco. Taylor Kitsch (Friday Night Lights) stars as Branch Davidian leader David Koresh and Michael Shannon (The Shape of Water) as FBI negotiator Gary Noesner in a six-episode drama tied to the upcoming 25th anniversary of the siege outside Waco, Texas. Based on two books, one by Branch Davidian survivor David Thibodeau, the other by Noesner, it also stars John Leguizamo, Melissa Benoist (Supergirl), Rory Culkin, Julia Garner, and Camryn Manheim. 10 p.m. Wednesday, Paramount Network (formerly Spike TV). One Day at a Time. One of last season's best comedies returns for a second season. A reimagining of the Norman Lear sitcom featuring a Cuban American family, it stars Justina Machado as a single mother and Afghanistan war veteran sharing an apartment with her two children (Isabella Gomez and Marcel Ruiz) and her irrepressible mother (the legendary Rita Moreno). Watch it all in a weekend or save it for those nights when the news sends you in search of both meaning and laughter. Jan. 26, Netflix.